The Bergamasco is a sheep dog believed to have descended from the longhaired shepherd dogs brought to Italy by Phoenicians. Their origins can be traced back nearly 7,000 years. They're known for having a strong work ethic and being highly intelligent. They think independently, and tend to see themselves more as an equal partner than subordinates to other members of the family. The breed has an unusual felted coat consisting of three types of hair. They have a fine, dense, and oily undercoat, long hairs similar to a goat's, and a wooly outercoat. After the mats "set" at age one, the coat doesn't require much maintenance. The dogs should be bathed 1-3 times per year, and never brushed. Shedding is minimal. Bergamascos are known to be very sociable. They have extremely good hearing and the AKC claims an "almost phychic awareness of its environment." They are reliable predictors of approaching visitors and violent behavior. 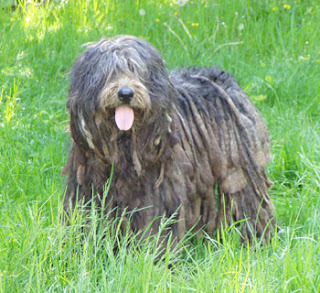 If you want more information about the Bergamasco, check out their pages at kennelclubusa.com and the AKC. Aren't they cool! Rastafaridog, lol! Oops, wrong account, oh well, lol!